Across the world, students and professionals who are visually impaired desire quick and easy access to their books, files and notes at an affordable price. Surpassing their aspirations we present a revolutionary product. Now get instant mobile connectivity and access to millions of books in Braille at your fingertips. Braille Me is powered by our patented Braille cell technology enabling an affordable, portable and user friendly Braille display. 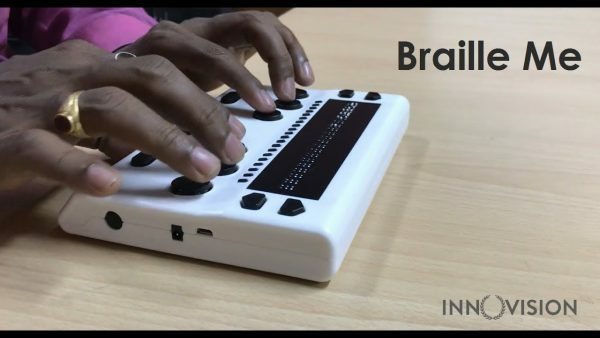 A fast, smooth six-dot 20 cell Braille display for digital content. The Braille dots are specially designed to give a paper like feel. For input a 6-key Perkins style keypad and 20 routing buttons are provided. For students to access files from an SD card by browsing, editing and searching content using keywords. Files can be created, edited, renamed or deleted from the device itself. For working professionals to take notes and read documents, reports etc. The editor supports .TXT , .BRF and .BRL files and has several navigation modes. It also allows for searching keywords inside the file for easy access.